The world’s smallest electronic parking disc. Takes up very little space on the windscreen and yet the large digital numbers are easy to read. The time, date and parking mode on the display on the inside of the car are just as easy to read. The display is angled correctly and the contrast perfect. PARK MINI is designed to meet the smallest dimensions permitted by law. When you have a PARK MINI, you no longer have to think about setting your parking disc. Fit PARK MINI in the bottom right-hand corner of the windscreen. 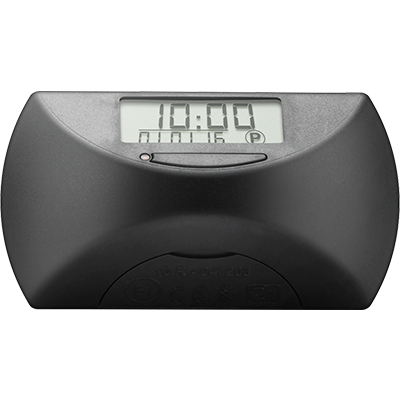 The disc takes care of everything, even changing automatically between summer and winter time. Ideal for micro cars. The design of PARK MINI embraces innovation, timelessness and uncompromising functionality. Adapting functionality and making something this small so easy to read was indeed a challenge. PARK MINI is simple and elegant with well-balanced lines and details. 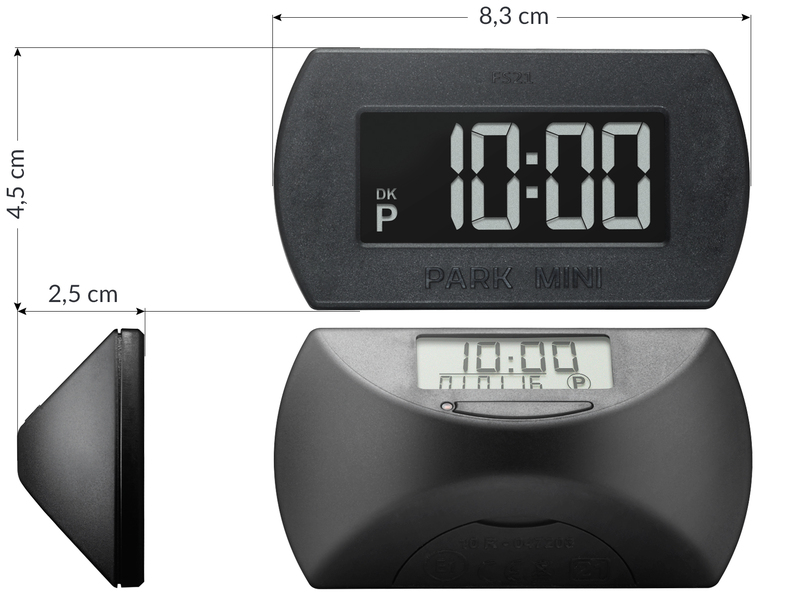 PARK MINI is the world’s smallest electronic parking disc. It takes up very little space on the windscreen and has a simple and yet luxurious design. The figures on the display (seen from the outside) are 20 mm high and therefore meet the minimum requirement for digital figures on a parking disc. Despite its diminutive size, PARK MINI is just as efficient as other Needit parking discs. The size and angle of PARK MINI’s back cover display make it very easy to read. 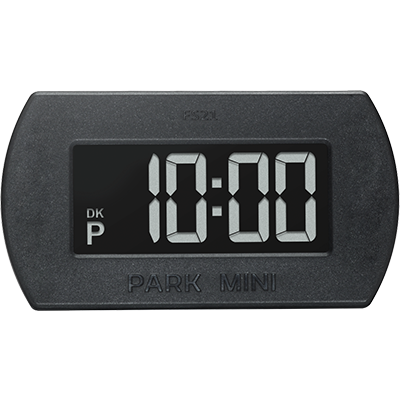 Several customers have told us that they use PARK MINI as a clock when they are in the car. PARK MINI builds on experience gained from ParkOne and Park Lite. It is therefore thoroughly tried and tested. PARK MINI has a strong, very rigid design which makes it robust. 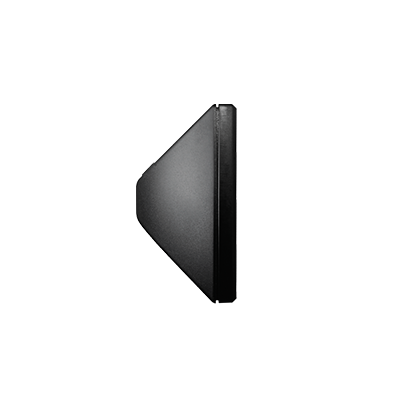 The disc can be withstand being moved repeatedly from windscreen to windscreen and from car to car. 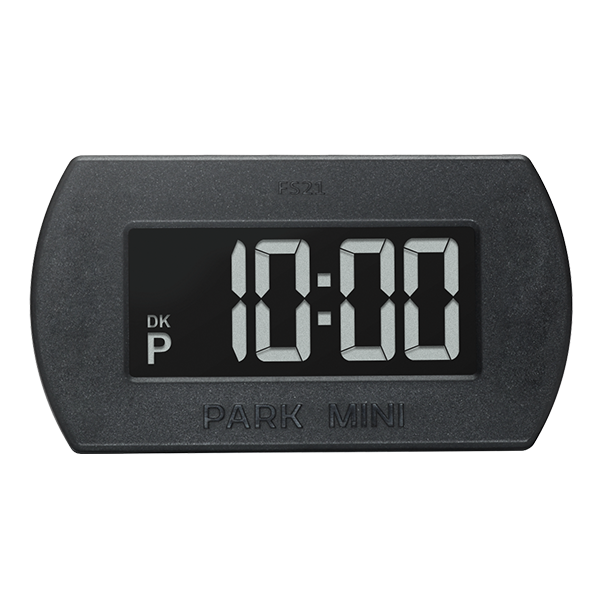 PARK MINI is available in black. We offer an extra set of 2 x 3M self-adhesive pads and a cleaning cloth (packed in a small bag). Cleaning cloth and self-adhesive pads are available from your PARK MINI dealer. Follow the assembly/disassembly instructions in the user manual supplied with your PARK MINI. Download the user manual here. PARK MINI is approved by the Danish transport authority in accordance with Executive Order no. 237 (2003) on parking discs, and approval code FS21 is imprinted on the front. To gain Danish transport authority approval, a parking disc must be 100% reliable and the parking time on the disc impossible to manipulate. All components – including the battery – are tested at SGS Fimko, Finland’s leading supplier of testing and certification services.